Labor unions are holding off on endorsing the Trump administration's renegotiation of the North American Free Trade Agreement. President Trump campaigned as a trade skeptic, winning over a number of blue-collar voters in key swing states with his pledge to veto the Trans Pacific Partnership and to renegotiate the U.S. free trade deal with Mexico and Canada. Labor unions have spent decades decrying NAFTA's effects on wages and outsourcing, but many are withholding judgment on the framework laid out on Monday, which has been dubbed the United States-Mexico-Canada Agreement (USMCA). 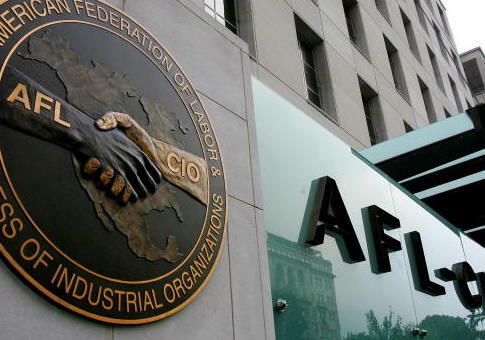 AFL-CIO, the nation's largest labor organization, praised the administration for taking aim at outsourcing but emphasized it needed more specifics before endorsing. The union called the draft agreement "a good start," adding that the White House had "incorporated some of labor's advice." "We simply do not have enough information at this time to know whether NAFTA 2018 is in the economic interests of the United States," the union's trade specialist Celeste Drake said in a statement. The union said the new deal had made progress on some of the labor issues that led American companies to outsource jobs to Mexico to cut labor costs. It praised the new agreement for providing "improved labor rules, including detailed obligations to eradicate Mexico's protection contracts, in the main body of the text," as well as new rules to prevent non-NAFTA countries from "free riding" on the reduced tariffs laid out in the original agreement. The union, however, said the administration should have pushed harder for stiffer regulations and protection of namebrand drugs over generics. Other labor unions embraced the new deal for its potential to boost wages in the United States. United Auto Workers president Gary Jones said he would like to see increased protections for Mexican workers and higher wage rates to cut down on the incentives to outsource, but is pleased with what he has seen from the deal. The union, which also falls under the AFL-CIO umbrella, said it is also not ready to gives its blessing to the agreement until all details are released. "We think the idea and concept of the USMCA could have the potential to provide some needed relief for America's working families," Jones said in a release. " We need to review and resolve the details of the agreement when they are available to be sure that this agreement truly ends NAFTA's legacy of shuttered factories and low wages." The administration made auto manufacturing a centerpiece of renegotiations to address outsourcing to Mexico. After NAFTA, car companies shifted a number of manufacturing jobs south of the border where workers earn an average of $7.34 an hour making cars and $3.41 an hour in auto parts supplies, a steep drop from American wage rates of $29.62 for production workers and $20.81 at parts manufacturers, according to the Bureau of Labor Statistics. The new agreement requires that at least 75 percent of all car parts be manufactured in North America and also sets new wage requirements that at least 30 percent of cars—jumping to 40 percent in 2023—be made by workers making at least $16 an hour. Trump celebrated the new deal as "historic" in a Monday announcement, calling it a balanced agreement that will benefit all three countries. "This new deal will be the most modern, up-to-date, and balanced trade agreement in the history of our country, with the most advanced protections for workers ever developed," he said. "Mexico and Canada have agreed to strong new labor protections, environmental protections, and new protections for intellectual property." Once the final details of the deal are put into place the agreement will head to Congress for approval. If the USMCA is approved, it will be set for renegotiation in 16 years. This entry was posted in Issues and tagged AFL-CIO, Auto Industry, NAFTA, Trade, Unions, United Auto Workers. Bookmark the permalink.